Metal office furniture cabinets will never do the job we want them to do. Even in this digital age, every business continues to use printed media. The recent push to create a completely paperless office is beginning to subside because a complete transition to electronically stored data is simply not practical for the average American company. It has also turned out to be a lot more expensive than the original ideal was intended to be. In light of this, it is reasonable to conclude that we are still many decades away from a work environment where our only tasks will be the realignment of little bits of data on a screen. Realistically, and for the foreseeable future, most of us are going to have to push a pencil every once in a while, and all of us are going to need to have a way of efficiently organizing printed media without wasting precious floor space (or cluttering up our desks) in the process. Humans have a bad habit of thinking in an exclusively linear fashion. When someone suggests it’s time to get new office furniture cabinets, most people immediately visualize some sort of rectangular mini tower with sharp, right-angled drawers. This is because retail stores like to push these filing cabinets as an efficient way of organizing paperwork in hanging folders. The original idea behind this design was good, but like many bright ideas that pop into people’s heads, the real doesn’t work nearly as well as the ideal. Metal office furniture cabinets and cardboard hanging folders have never been a good way to organize paperwork. These folders have a nasty tendency to separate when holding multi-page, stapled documents. Even worse, if one of the hooks on either side of the folder happens to break, there go all of your nicely organized papers into a newly arranged pattern that resembles a hand-held paper fan. Whenever this rearrangement occurs, it never fails that the most important document you stored in that cabinet turns out to be the one piece of paper out of thousands that mysteriously vanishes in complete and total defiance of every law of physics known to science. While this may make some of you laugh, these observations are not meant to be funny. They are meant to make you think. A metal office furniture cabinet, like the ones you can buy in any office supply store, offers far less actual storage room than you think. Forget about such taglines as “holds as many as 500 folders” and “more room for folders than ever before.” The only way you can fit hundreds of folders into some of these cabinets is to use empty ones. This is not only an inefficient way to store documents, it is also an inefficient use of floor space. Vertical file cabinets fill up faster than anyone expects. When this happens, most companies simply buy more filing cabinets. This works for a while until there are too many filing cabinets interspersed throughout the various departments within the offices. People being to feel claustrophobic when this happens. It is one thing to have one or two metal cabinets snugly nestled into one corner, quietly reminding everyone in the room how organized and efficient we all are. However, when filing cabinets suddenly begin to multiply, as if they are taking over the office with some strange life of their own, they become negative symbols to our minds. What once represented neat, tidy, order and system now represents clutter and controlled chaos. No one can feel good in such an environment, and process flow is never consistent in such a space. 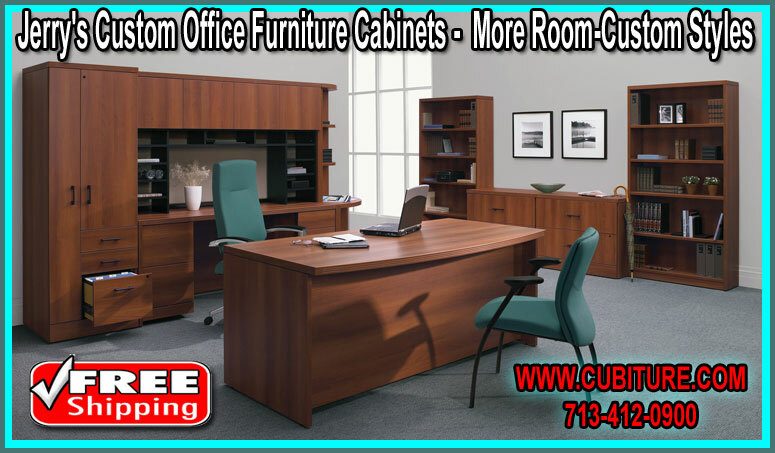 A more efficient way to organize documents is to invest in office furniture cabinets that run along the walls and feature longer drawers designed to hold thousands of documents at once. For every square foot occupied by a lateral filing system, the amount of storage space is exponentially greater than the interior of an entire office furniture cabinet. Many times, we can eliminate as many as 8 vertical office furniture filing cabinets and fit their combined contents into one lateral system that runs between 2 desks in the back of a single office. This clears the room for improved production, additional staffing, and an overall better feeling in the air. Call Jerry now for more information on lateral office furniture cabinets or high-density shelving or filing systems.